High frequency plastic welding machine is using molecular vibration (friction heating) to provide uniform heating of products. When the heat is transferred to the electrode (mold), the press can provide protection to the product surface, thus result in good welding performance. All materials which have polarity, such as soft PVC, Polyamide (PA), Polyester (PES), Polyurethane (TPU) and some special TPO and some composite materials can be welded with enough high-frequency response or heating elements. As of none-high-frequency-respondent materials, such as textiles, can be coated with high frequency-respondent materials such as PU or PVC to enable high frequency welding. The other method is to apply a layer of hot melt glue on the non-high-frequency-respondent material. It can also provide a successful products welding in most cases. The most important function of High frequency plastic welding process is to bond two pieces of plastic materials, such as canvas welding and embossing for sutable plastic machining, such as PVC foam embossing on gloves or shoes, then tear off the exceeding material after high frequency embossing. 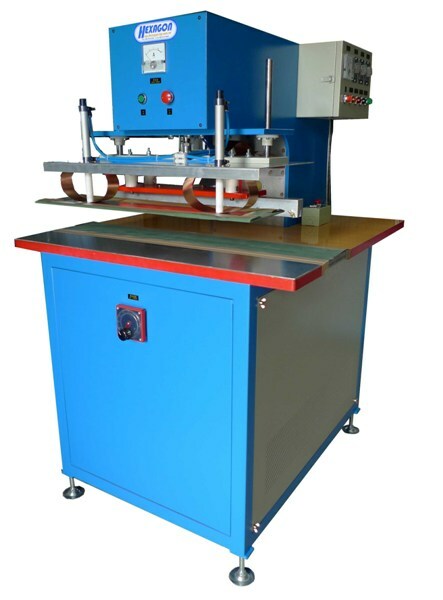 High frequency plastic welding machine is most commonly used for PVC and PU products welding. Common products are automobile mats, inflatable boats, water beds, urine bags, raincoats, tents, and advertising canvas. High frequency welding can also apply on the following products: Canvas, tents, awnings, large advertising inkjet canvas, blister packaging, inflatable toys, PVC and PU running belt, PVC and PU conveyor belt and raincoat.